He has had it with the stupid, lazy, greedy, cynical, and uninformed forces setting outrageous education policy, wrecking childhood, and preparing students for a world that will never exist. His keen intellect, courage, and razor-sharp wit cuts away several layers of conventional wisdom; causing readers to confront their own prejudices and school-distorted notions of learning. No sacred cow is off limit – even some species you never considered. The short essays in this book will make you mad, sad, argue with your friends, and take action. Most of all, Education Outrage is funny as hell. Dr. Roger Schank is an expert learner and expert on learning. His professional accomplishments could fill several lifetimes. Schank is a distinguished university professor, mathematician, linguist, computer scientist, artificial intelligence pioneer, entrepreneur, TV host, software developer, author, parent, grandparent, and softball player. 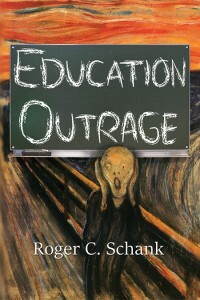 Education Outrage is a curated anthology of essays from his popular blog with a foreword by Gary S. Stager. For volume sales, contact CMK Press.